Want to turn every head in your gym? Give us 12 weeks. If you’re one of those guys who thinks of the bench press merely as an exercise to be incorporated into your chest routine, it’s time to think again. Done right, the bench press can be a whole-body movement that develops overall strength and muscularity in a way that few other exercises can. It also happens to be the one move you can perform in a gym that, when performed with respectable weight, is sure to turn heads. The trick to achieving all the benefits this iconic exercise has to offer, however, is to train specifically to improve your bench—a task that might not be as intuitive as you’d assume. Every major muscle group in your body plays a role in proper bench pressing, especially when you start adding serious weight to the bar. And the fact is you can move major poundage whether you’re naturally barrel-chested or shallow, long-limbed or short, so long as you make the effort to develop all the supporting muscles that are recruited during a big bench. Once you do create this synergistic framework, though, you’ll be able to handle much heavier loads than ever before, which in turn will allow you to develop your chest muscles faster. We’ll explain the role each of these supporting muscle groups plays and provide the optimal strategy for bringing them all together to turn you into one big, bad benching machine. BENCH PRESS - It all starts with proper setup: Plant both feet firmly on the floor with your toes pushed to the front of your shoes. 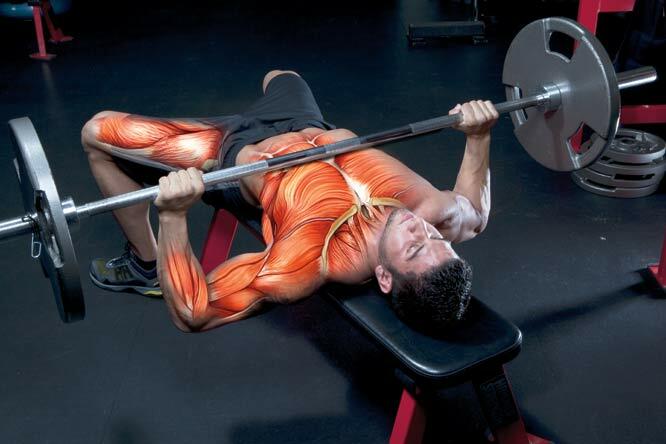 Retract your shoulder blades onto the bench, squeeze your lats, and put a death grip on the bar.